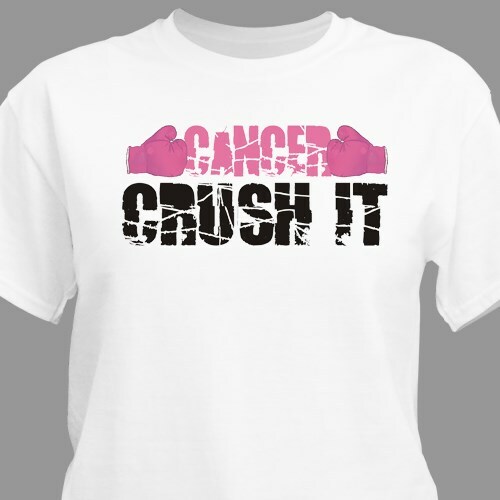 Help get one step closer to putting an end to breast cancer once and for all by wearing our Crush Cancer Awareness T-Shirt. Our Cancer Awareness Shirt inspires, educates and encourages all to get involved in the journey towards a cure. Your Cancer Awareness T-Shirt is available on our premium 100% cotton T-Shirts, machine washable in youth sizes XS-L and adult sizes S-3XL. Additional Info At MyWalkGear.com, we know how important it is to bring attention to every cause out there. That is why you will find we have a tremendous selection of Awareness Gear and Walk Apparel. View our entire collection of Breast Cancer Awareness Apparel and Walk Gear to help kick start your journey. If you enjoy this shirt design, you might also like our Cancer Stinks Water Bottle & our Breast Cancer Awareness Ribbon Dog Tag.